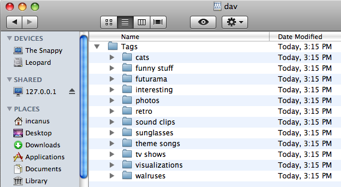 Drupal File Taxonomy Server public release! I've finally been able to make a public, alpha release of the File Taxonomy Server for Drupal 6, allowing integration of a Drupal site's category structure into a drag-and-drop WebDAV interface. I blogged about this software a bit previously, but am finally getting some code out there. If it sounds like something you'd be interested in, then I encourage you to check out the project and give it a spin. I've fixed a couple minor bugs and now the install instructions mention the latest tested versions of the DAV API and File Framework projects, so it should be pretty easy to get going. 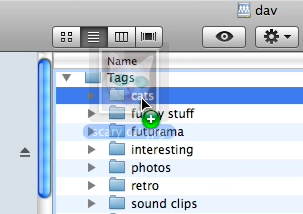 You can create and edit categories and upload and tag files to your site, all from the comfort of your WebDAV client, including Mac OS X's Finder, Windows' Explorer, or other applications like Transmit, Coda, and Cyberduck. Feedback is welcome, but please report bugs over on the project page, not here. I welcome comments and feedback, but please try to keep official feature requests and bug reports over there.